Everyone’s always asking us “how’s the house?” “what are you guys working on?” “what kind of projects are you doing?” and most of the time we’ve got a pretty good story to share. Lately, we haven’t had anything big to update on. Instead of something fun and exciting, we’ve been telling people about our plumbing issues. This one is a bit complicated, but it involves something we’ve been putting off since we moved in. We’ve always known something wasn’t right about our washing machine set up, but since it had never given us problems, we never did anything about it. The washer had been draining out into a 1 inch pipe that it just barely fit in. So much so that it was duct taped in place. Fast forward to a few weeks ago. We get a back up in our line somewhere, the kitchen sink drains slow and we hear a weird noise when the toilet flushes. We’ve got a clog. Of all places, water, probably just drained from the washer, backs up and starts leaking at the duct taped connection. The clog is removed by a professional, who sends another guy with one of those drain cameras back later that night. What does he find? A golf ball sized clump of something in our drain halfway out to the street. Luckily for us it wasn’t a tree root growing through our pipes. I still think it might have actually been a golf ball, but who knows. To rectify the weak point beyond the washer, we had a plumber install a new exit, and get it up to code. Everything was replaced with 2 inch PVC and a new clean out what installed. He also finally disconnected the gardening hose that our old toilet was hooked up to. OK, so I’ll admit this post was kind of boring, but activity is activity and an update is an update. This is one less thing to worry about, and now we’re up to code. Stay tuned for a project that’s a little more exciting, I promise. Our laundry situation hasn’t always been the best. Our washer is in one room and our dryer is in another. Until recently sitting right next to our dryer was a weird, non-functional toilet. We’ve always thought about moving the washer in with the dryer, but that would require some plumbing work that we’re not really ready to undertake right now. For now we’re tackling little projects and small victories. In this case, we’re improving our current set up and making it more efficient. Let’s start outside. Recently we started noticing lots of lint in the driveway. As it turns out, our dryer vent system needed a cleaning. This of course leads us from dryer vent cleaning to dryer vent improvement. The old dryer vent hood on the outside of our house was in worse shape than I thought. When I took it off, I found that it was permanently held open by old lint and who knows what. This was a great opportunity to clean out the entire pipe system and replace the dryer vent hood. This simple hood cost less than 10 bucks at Lowes, and only required some concrete screws and a little bit of silicone sealant. For those of you reading this that aren’t familiar with wacky alternative ways to heat your home in the winter, you might not know about dryer heat diverters. For the un-initiated, it is a small device that goes inline with your dryer exhaust. In theory this thing makes sense. In the winter time, flip the switch and divert all that wasted heat back into your home. In practice, you’re sending moist air back into your basement. I can understand the concept of wanting to use it like a heater and humidifier in one, but it makes us really uncomfortable. Moisture is something I don’t want in the basement ever, let alone in our utility room with our heater and hot water heater. This device was promptly removed once I figured out what it was. To replace the heat diverter, I installed this draft blocker. This will prevent the cold air from coming in through the vent. Not that we had a problem with this or anything, but why not? OK, so I’ll be the first to admit it, our utility room is far from luxurious. Keep in mind this is a work in progress. Our washing machine is still in the finished part of the basement. Now that the toilet is gone, maybe we’ll move it over there. The plumbing is there for it, sort of. It might need an upgrade. For now, I’ll take this small victory, of a slightly more efficient and practical laundry clothes dryer area. As our loyal readers know, our house could easily be compared to an antique collectible. It was built from scratch by the original owner, so many things throughout the house don’t make much sense (for lack of a better phrase). When we had our bathroom re-done last year, our contractor couldn’t believe some of the “surprises” he uncovered, like an entire electrical box for a light switch just hanging by a bit of spray foam – that was a good one. 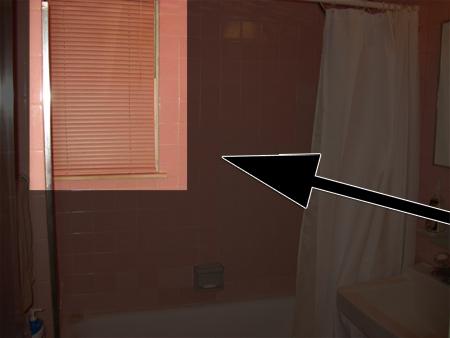 Or how about the window in our shower from one of the additions? I think that’s my all-time favorite. Either way, you have to believe we are constantly finding surprises around every corner. Which brings me to the point of this whole post; plumbing. The plumbing in our house seems to work just fine, but according to professional plumbers, it is less than desirable. We have a pipe in our basement that has started this teeny tiny pinhole leak. It’s not even a leak yet, more like a tiny drip. So…we called People’s Plumbing, which lucky for us, is right in our neighborhood! The guy who came out to take a look was kind enough to take a short tour of the whole plumbing situation we have going on in our basement. Not only are we going to have this leaky pipe replaced, we’re going to have a nearby, less-than-perfect pipe configuration re-done AND we’re going to finally get our antique toilet removed! (Have we ever showed you this guy before)? 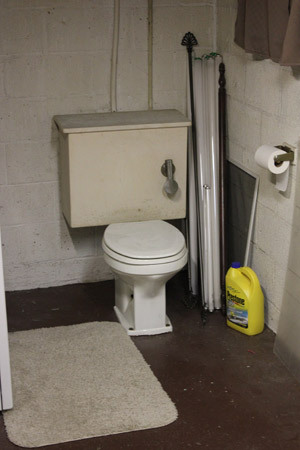 We got a quote from someone last year to see how much it would cost to remove that unsightly toilet and they said it would be around $1,000. People’s Plumbing is going to get rid of it for $125! After the toilet’s out, we’ll probably really clean up that room and paint it. 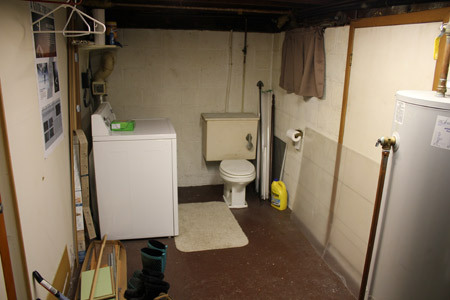 We only really use the basement for doing laundry at this point, but getting rid of that toilet will make a big difference! Keep checking back and be sure to ‘like’ our Facebook page for a follow-up on this plumbing project!